How to Keep the Kids From Getting Bored? Summer Fun in Your Backyard! Children of all ages, across the USA, are jumping for joy with the beginning of summer vacation, but for lots of stay at home moms and dads, hot summer days and the last day of school means days to fill with planned activities. The question now is “How to keep the kids from getting bored?” Better yet, what to do when you hear the dreaded words, “I am bored?” To keep boredom at bay you need great ideas for outdoor play. If you’re looking for fun activities for outdoor play, read on! Get those kids outside playing, instead of spending days inside, watching re-runs of there favorite TV’s shows. Call their friends and cousins over and enjoy the fresh air outdoors by climbing and jumping on bounce and jump houses, playing on swing sets, and camping out with play tents! Many people choose to rent bounce houses for birthday parties or family gatherings, but there’s no reason they have to be limited to a special occasion. They are fantastic for everyday use and not just once or twice a year. Now, more affordable than ever you can purchase an inflatable for your families entertainment and use it when ever you want. Bounce and jump houses are a great outdoor activity for children from ages 3 to 12 because the children are easily entertained and occupied for hours at a time with the bouncer. For a little extra fun, add some play balls and now you have a ball pit. Children will have fun throwing and catching the balls or may even let there imagination go wild as they create their own games or just bounce and jump away the day. Most inflatable water slides and water parks can be used WET or DRY, which is perfect for year-round play value. Make sure you have a nice, big lawn as most water parks are quite large. The challenge and the thrill of the slide will have the kids getting soaked for hours. Look for inflatable units that have wading pools at the bottom of the slide. This allows the kids to splash around and rest before they slide down again. One very important reminder for parents who purchase these toys is that you must store the units when they are completely dry. Please follow thorough drying instructions from the manufacturers when deflating, for proper care and to avoid unnecessary water weight. Inflatable must be 100% dry before it is stored. Is the park all the way across town? Is the park maintained and the equipment safe? If not, you should consider building a swing set to your yard. With many styles available, the possibilities are endless. Many are made from solid steel, pine or cedar lumber that can last for years in all sorts of climates and weather conditions. Swing sets can be customized so you can have just the style you want. Plus, there are units for different age groups and interests. One common feature is the fort, slide, rope ladder, sandboxes, monkey bars and most important the swings. From tower to picnic tables, youngsters will have fun playing for hours on a swing set. Let there imagination run wild as they become captains of the sailboat, or pretend to be a princess in the castle. Your backyard will become the hit of the neighborhood and a favorite hangout for all the children. There are lots of manufacturers of playground equipment and each one makes a different type of set so do your research and you will have fun selecting the set that’s just right for your family. Summer also means outdoor camping, so grab your play tent, sleeping bags, and plan a backyard camp trip. You do not have to visit the camping grounds for this fun event. Children will enjoy nothing more than playing outside in a teepee tent or play tent. Have a picnic or tell stories inside the tent or better yet, play board games. If you do not have an outdoor tent set up your play tent in the family room and have your fun there! One bonus of camping out inside is that your kids bedrooms are right around the corner if they decide they want there own bed. Playing with outside toys is just a few of the ways to spend summer vacation. Jumping on bounce house, and playing in water parks, or swinging on swing sets, camping with play tents are a few summer activities that you can plan to do with the kids. With just a little effort, you’ll be able to plan an event for each day of the week and post it to the calendar. Hopefully, you will not hear those dreaded words, I’m bored! If you would like to have a swing set for the children in your backyard continue reading this article. Do you think you don’t have enough space? There are plenty of options available. Having a small yard is common and with some research you can purchase a swing set. In most cases, there is sufficient play area for construction. You can build one of those nice-looking swing sets in the garden. While it is true you won’t get all the bells and whistles including multiple forts and slides you can purchase playsets that will work when space is limited. You must first determine the amount of space available. Knowing those exact measurements is beneficial. If you are like most of us and don’t have a roomy garden area there are options available. Most styles are built from diverse components such as metal or wood. Lumber choices include pine, cedar, white cedar, vinyl or redwood. Wood play sets are creatively fashioned with forts and tower along with play accessories that really entertain children. For a smaller area, almost all manufacturers make smaller versions of those elaborate play structures. These residential swing sets are offered in many configurations including the sizes and scope with different variations. With a wooden swing set you can start with a small design and still have the accessories the kids want. Available today; are models that have two swings on the top beam or a catapulted beam which is a smaller beam across the front of a tower. This allows you to have one swing on each side of the play tower or play fort. The catapulted beam is one feature that is offered by the Woodlawn company and it is a unique design. This design really saves on space. Searching for designs that offer flexibility with the placement of the slide is easy. Many models allow for this because the slide can be moved to the longer side of the unit or to the depth side. Also, if you do not have room for a slide make sure to inquire about the stability of the unit without it. Additionally, look for models that do not offer this option. 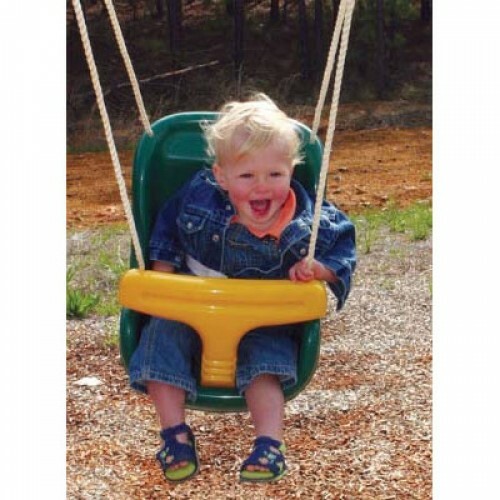 Metal swing sets come in a variety of styles with swings. Aluminum designs are favored as they are built lightweight and are easy to handle with little up keep. These styles offer stability and sturdiness due to their well-built designs and anchoring system that uses concrete. Then again, a lot of residents decide on steel for their strength and durability. Not only do they look great when built they are usually made in bright vibrant colors and also have accessories. For example; gliders, slides and swings are some of the most common accessories. Most as a rule have matching accessories that are color-coordinated to compliment the swing set. These days, companies that manufacture this product have improved the models in terms of safety and components. This improvement results in safer structures for the kids to play on. The current industry trend is to have colossal play structures that develop into an entertainment area for the whole family. While this is a fantastic idea if you have the room in the garden and the budget for it many consumers do not. That is why metal swing sets are a good alternative. Searching the internet for swing sets and play sets is the easiest option. This way you can compare models and take notes to find out which type will work in your small space. While there might still be a slight chill in the air in the evenings across the country spring is here and summer is right around the corner. As the warmer weather arrives and we say farewell to cold days children are raring to go; to get outside and play. Trees and flowers are stating to bloom and it just might be time to get those outdoor toys prepared for the children to start playing with. Tree swings, playsets and swing sets are always a favorite outdoor activity for the kids. If you are fortunate to have a backyard swing set now is the time to complete your annual assessment and possibly add or replace swing set accessories. Inspection of the play set ought to be a priority. Replacement parts for chains, nuts and bolts as well as new accessories are readily available in the brick and mortar stores and online retailers. If you started with a small structure and are thinking of adding on to your play set there are many fun and exciting ways to accomplish it. Adding an extra slide, fort, rock-walls, bridges or tower toys makes the swing set new again. Kids get excited when they have new playthings that entertain them for hours. The varieties of tower toys includes steering panels, tic-tac-toe spinners, chalk boards, periscopes and telescopes which are made for upper and lower play towers and forts. Tower toys are easily interchangeable as children grow. The addition of an extra slide might be a 10 or 14 foot straight slider, or a corkscrew or spiral design. This will create a lot of excitement as they climb and slide their way to fun. Add a radical tube slide off the fort and have fun watching as the kids experience a thrilling ride. After you have completed the inspection think about the safety of the kids playing on the structure. If you don’t already have ground cover this is worth researching. Also, think about ground cover mats. These work out nicely underneath the swings or at the bottom of the slide. It provides a little cushion at the landing. What’s more when positioned on top of ground cover it helps to keep the surfacing in one spot. Safety rails for access ladders or safety handles at the fort openings make it easier for younger children to climb in and out. Safety Bumper Pads can be added to the wood right above the slide exit, this bumper pad folds over the 2×4 wood and secures in place with hook and loop fasteners. If during your inspection you noticed the rubber on the swings cracking or rope fraying this is an indication that replacements are needed before anyone uses the swings. In addition, if you noticed any links on the chains or plastisol loose on the chain make sure it is replaced. Keeping kids safe is a priority for any parent. With the installation of new swing set accessories or components to replace existing ones make sure to follow the directions for proper installation. Refer to manuals for step by step instructions and it is a good idea to save the manuals just in case you need to review at a later date. Swing-N-Slide is just one of several brands that offer a large selection of replacement parts for wooden swing sets. Whether you are looking for substitute components or new exciting items to enhance your backyard experience you will find an enormous amount of products online that are made with a child’s safety in mind. Reminder, as always adult supervision is always required for safe play. There is nothing as entertaining for children including their parents than flying down a slide. Regardless of their ages, sliding is one of their favorite activities when playing on a swing set. You will find an assortment of models and sizes available either for replacement or additions to existing structures. They are available in different sizes, colors and easily install if you need a replacement. Children love outdoor activities that include playing on swing sets and this piece of writing will be the focal point on slides along with a few reminders about safe play. If you have an existing playset and need a replacement they are readily available. The most important thing you will need to know is the height of the play deck that it attached to. Most are 4 feet, 5 feet, 6’ or 7’ in height from the ground up. Knowing this measurement in advance will prevent you buying one that is to short or too long. Look for features like wide handrails and manufactured with fade resistant polyethylene. Most manufacturers offer a warranty against cracking or breaking and some even have a lifetime guarantee. Make sure you never install over a hard surface such as concrete, gravel, or asphalt so that you do not cause injury to a fall. Level ground is important and away from things like a fence, tree, garage, wires, etc. Ground cover and protective surfacing should be at least 6 feet out and around the play area. Without a doubt you should consider a plastic made slide as metal often becomes extremely hot to the touch. These guidelines will be outlined in the instruction manual so please read and make sure you adhere to the advice of the manufacturer. 1. Always so down with their feet first and never go down head first. 2. By no means push or roughhouse while climbing up the ladder or sliding down. 3. Explain why using the equipment properly is so important to their safety. 4. Never stand on the slide. 5. Never climb up the slide or hang from the side guardrails. 6. If the slide is wet do use it because the surface area will be slippery. 7. Cool to the touch is the rule, and if it feels hot it is not safe to play on. 8. Do not wear clothing that has a drawstring such as a hoodie or sweatshirt or other loose items such as scarf’s or necklaces. Avoid this type of clothing to prevent strangulation hazards. You will be amazed by the collections of styles that are for sale today. They range in size, design and color. New polyethylene allows for better construction making them last longer. You’ll find styles like wave, scoop, and straight designs as well as turbo and radical styles. You’ll also find the sidewinder models and the one the kids most often want is the tube slide. If the intended use is as a replacement or added to new construction you will locate them easily by shopping at Best Price Toys. A KidWise Playsystem swing set will undoubtedly provide a wonderful place for your children to play. What child doesn’t like to have a place to climb, swing, have picnics, and play in a sandbox? What parent wouldn’t smile at the sheer joy and laughter that a playcenter will bring? However, fun and laughter is just the tip of the iceberg. There are many other benefits to having a wooden swing set in your backyard. That’s why we’ve invested our lives in making Congo swing sets for children all across the North America to enjoy. Not only is it an investment in your child, we view it as an investment in families as well. Physical development: When climbing a rope or learning to “pump” their own swing, your child will be building strength, coordination and agility. You will marvel over the course of a single summer as you mark their development and growth. Watch over time, as they go from standing on your shoulders trying to do the monkey bars to flying across all by themselves! Social development: Side-by-side is the key to teaching children how to share, take turns and collaborate. Not only fun, play is the way children can experience success, try on different roles, practice being in charge of their own activities and interact with others. Sharing a swing for example, helps a child learn patience and to be considerate of others’ feelings. Cognitive development: When your child plays in a sandbox, they not only learn to exercise their imagination, but they also learn the concepts of size, shape, volume, empty and full. Climbing up and going down the slide is the perfect lesson in gravity. Play is your child’s work, teaching them in ways you might never have thought about. Togetherness: Having a wooden swing set right in your backyard will lead to magic moments when you least expect it. You’ll watch in amazement as your child learns a new skill or asks you to join them at an imaginary tea party. Most importantly, a KidWise Congo swing set will provide the opportunity for your child to build lasting friendships, and for you to play with your children and other families and their children right in your own yard. Safety: Your children will play in your backyard, not at a park up the street where you can’t see or protect them. Friends will congregate. You’ll know with whom your children are playing. You’ll observe how they get along with others. And you can supervise them while, at the same time, giving them the opportunity to play on their own, learning independence in a protected environment and having a great time. Longevity: From pushing your child in the toddler swing, to watching him or her swap stories in the playhouse with friends – a wooden swing set will engage them for years. These playsets are designed to grow with your children as they grow and their skills improve. It’s not like the “hot” toy that sits gathering dust a few weeks after your child receives it. A wood play set will be used season after season after season. You’ll wonder why you didn’t get one sooner. is perfect for cozy yards. Challenged to create a smaller version of our classic swing sets, we set out to build the strongest, most compact set on the market. By designing a high-quality, maintenance free with superior strength lumber, this compact model is as strong as every swing set Kidwise makes. The wonder wave slide and the belt swings are the great recipe for fun all day long. The Congo is a great alternative to a metal swing set – proof that good things do come in small packages! Our signature Monkey Playsystem 4 is sure to be the congregating place for all. Beautiful and painstakingly well thought out, the Monkey 4 provides room for adventure and imagination. Your kids can roam in and out of the two towers onto the turbo slide and learn to master the fire mans pole and even share take a break at the picnic table and enjoy a snack. So incredible and large, the kid in you might resurface and join the fun. With a two towers and a toddler side deck, the Monkey Playset offers plenty of room for even the loftiest of imaginations. This comes standard with two slides, three swings and an option to add on a rocket rider for two. With plenty of climbing options, you’ll be tempted to spend some time there yourself. This charming swing set promises unlimited opportunity for creating childhood memories that will last a lifetime. Let the adventure begin! In the Congo Lookout & Safari, we’ve crafted a rugged play center in keeping with our high standards of excellence. It’s intended to take anything a child can dole out while keeping boredom away. Uncompromising quality and versatility are combined with a generous measure of play space that includes 14 different play stations. The Condor provides plenty of room for adventure and imagination, perfect for adventurous little mountain climbers or sea captains. What are you waiting for? Let the fun begin. This is our most popular model – and for a reason. Uncompromising character and versatility are combined with a generous 50 square feet of play space in this wooden swing set. Longevity is ensured through our modular design. Simply add a second side deck, a picnic table or an additional swing beam and your Northwoods Hideaway will grow with your child over the years. Richly colored in nutmeg with garden green accents, the Northwoods Hideaway will bring a lifetime of fun and beauty to your backyard. Perfect for the adventurous climbers, the Eagle’s Lookout towers over all others. The combination of a seven-foot-high platform, a turbo twist slide and a flat-step high-climb rope ladder is incomparable. This thoughtful playcenter is cleverly designed to please even the youngest child. A second slide or rockwall, lower side deck and built in sand box will provide hours and hours of fun. You can spend time together digging, playing and climbing. Exclusively ours, it can be exclusively yours. What are you waiting for? Do kids really have a great time when playing outside? Is having a great time playing in the open air really as simple as stepping outside? Absolutely, without a doubt, walk out that door and you will see kids who love the playing outside. It is good for their bodies and good for their brains, just make sure they have plenty of toys to play with in the backyard to entertain them. Let the fun start, the second they head outside. Kids ages 3 an up can enjoy a wide array of outside toys just make sure they are age appropriate for them and that they enjoy constant supervision from mom, dad, or caregivers. This writing will offer suggestions for backyard fun that children really enjoy and that offer entertainment value for the family. Of course the first thing that comes to mind is a backyard swing set or a swimming pool. These are major investments and provide entertainment for the whole family. This fun environment in your own backyard is loads of fun provided you have the space and the budget for installation. When thinking about buying a playground or pool for the family’s use you will need to create a budget and a list of options you want. Planning ahead of time is the key to buying on sale for a good price. Even if you have to wait 6 months or a year before you buy early planning is essential. While many can’t afford elaborate swing sets or in-ground pools many can purchase small versions of products that are similar. For example, instead of a built in swimming pool you can consider an inflatable bounce house with a water park attached. Lots of fun just like pools at a fraction of the cost. Most of the water parks have at least one slide and a wading pool. It is easy to keep cool while playing on an inflatable water park. Children love to splash around and the small molded plastic pools are very affordable. They fill with water quickly, because they are small and when you are through simply flip them over and let the pool air dry and store. Swing sets have a wide price range and if your budget is restricted take into consideration a metal swing set. They typically are a fraction of the cost of a large wooden swing. If you have a big tree in the garden suspending a swing from a large branch might work. Tree swings are very entertaining without the expense of a swing set. If you have a deck in the backyard a new trend is attaching a slide off the deck for the kids to use. If you do this, make sure you have protective ground cover such as rubber mulch around all sides of the slide. Make sure the landing area is not on a hard surface like cement or brick pavers. If you want big toys for the backyard you have to make sure you have the room for them. Pre-determining the spot for set up is necessary and will make the installation easier. This is especially true if you need to remove trees, overhead wires and other obstacles prior to assemble. Enjoy the outdoors and nature with your family and spend quality time with them. After all, isn’t that what we all strive for? More playtime for everyone! Recall notifications are serious concerns when buying a used product. If you are considering a purchase of a used item be certain to research the style. Make sure you have the model number, know the brand name and year it was produced. Contact the manufacturer to find out if there were any recalls or safety issues with the model. A quick online search should provide you there phone number. Also, you can visit the U.S. Consumer Product Safety Commission website for further information. Additional, when purchasing used items you will need a copy of the assembly manual because it offers directions for correct installation and provides safety information with regards to weight limits and settings. A through inspection of the product must be completed. Take a look at the safety harness or belts to make sure they are not frayed and that the connections work properly. Look for cracks and rough edges that might pose a hazard. Check the overall condition and if you have any reservations then pass of the purchase. If the indoor swing comes with a frame check for rust, loose hardware, and that the unit is operational in working order. If the unit has an adjustable speed setting make sure you try all settings. Which type of seat belts are best to use? That depends on the type of baby swing you are deciding between. For example, if the swing is for a wooden swing set or metal unit look for a full bucket swing which completely envelopes the child. This type of swing is used when babies can hold their heads up. A high back infant swing is usually used when they are little because most of the models come with a security strap and a t-bar connection that is locked into place. If you are considering an indoor swing be sure to look for styles that are equipped with a five-point safety harness as this offers the security and piece of mind for caregivers along with mom and dad. Using only a seat belt by itself is not enough protection or safety for the baby. Infant high back outdoor swing is usually best suited for those under one years of age. After they can hold their heads up you will need to graduate them to a full bucket style. The buckets can accommodate baby’s that have outgrown the high back styles and toddlers up to approximately 3 years old. Half bucket is recommended at around 3 years of age and up. Pay close attention to the child developmental stages as they may outgrow earlier and you will need to discontinue using the product. Following the manufacturers recommended guidelines for weight and age must be adhered to at all times for indoor and outdoor use. Never leave a child unattended in a swing. This is one of the most important safety issues that must be followed. Remember that constant supervision is the key to their safety and never let a baby, infant, or young child swing by themselves. Vinyl swing sets are becoming the backyard adventures of the future and for good reason! Vinyl clad is proven to last longer than the average wooden or metal swing set. It does not rust nor does it create splinters. So when you purchase a play set from Swing Kingdom you are protecting your kids and your investment. You need a strong playset in the backyard that is going to last so think vinyl. These playgrounds provide the durability and clean look that you want in your yard and keeps your kids occupied for hours. In any season of the year kids love to play outdoors. Swing Kingdom playgrounds are the safest and most weather resistant playgrounds on the market. They have no splinters, low maintenance, and no painting or staining. They provide a decorative look for your backyard adventures and can even increase the value of your home. Families can start with a small set and customize it later down the road, easily adding another tower, or swing beam. Colors are consistent so if you were to add a green tower in 5 years the color will match your existing playset. The slides are made in house with molds that have double insulated wall sides. The slides are warranted and made in America. Safe for the environment. Children will fall and providing rubber mulch ground is just another options offered toward making a safe play environment for all. In business for over a decade, started in 2000 the owner Amos has personally designed each and every unit. Moved in 2006 to a large facility because the old building was too small to handle the explosive growth they were experiencing. Almost 90% of the structure is made in America by Amish in Pennsylvania. The company is family owned and understands a strong commitment to family values and relationships ensuring safe play for everyone. It is about families and playing outside together. This company stands behind their brand with a 25 year warranty and takes pride in the heirloom Amish craftsmanship that goes into every single playground. The resale value is tremendous because of the quality. A family could easily play on it for 10 to 15 years and turn around and sell it to a neighbor for a fair price. It will still look almost the same as when it was set up years ago. Close your eyes and imagine yourself as a kid again holding on tight as you can to an old piece of rope; an old tire swing, along the wind rustling through your hair as you sail thru the air. There is something indescribably alluring about a swing. That’s why children and their parents have always found a way to get one, whether it was a rope hanging from a tree or tied to the rafters in a barn or suspended over a lake. They have graced all playgrounds at schools and parks. There is something indescribably alluring about a swing. That’s why children and their parents have always found a way to get one, whether it was a rope hanging from a tree or tied to the rafters in a barn or suspended over a lake. They have graced all playgrounds at schools and parks. Make a priceless memory of happy children on a tree swing; memories of little things that really matter. Accepting an invitation to a baby shower is very special request for the parents who the shower is intended for. This occasion is an extraordinary celebration with close friends and family who want to share in their joy and offer a gift. Baby showers have been a proud traditional for a very long time and they are planned well in advance of the babies arrival. Finding the perfect gift will be easier than you think because there are so many choices and options worth your consideration. Chances are the mom-to-be has registered for all your baby’s essentials products including strollers, car seats, gear and more at a local department store. A mother-to-be often has a gift registry where she has selected several items that are on her/his wish list. Gift registry often will advise the color scheme of the nursery and if you view the entire list you can judge their likes and dislikes. Gift registry is a great concept and help with eliminating duplicate presents which result in returns and exchanges. As the gift giver, you never want your present returned because you want to see the item used or played with. What if you are an out-of-town guests and don’t have access to the store where she is registered or simply want to present a truly unique gift to the expectant parents. Often, before the shower takes place the gender of the baby is well publicized giving you the opportunity of a better gift selection. Deciding on a baby shower gift is a personal choice and while it is nice to purchase from the wish list it is also well-received to have a distinctive gift that is out of the ordinary. Choosing a baby shower gift is easy for most and finding one that will become an heirloom gift and one that can be passed down from one generation to the next is simply a fantastic idea! Think about products that will last and take time to search for baby shower gifts of heirloom value. While they might cost more than a traditional gift therefore think about asking other family members to consider purchasing the gift together. Heirloom gifts can include wooden rocking horses especially if it is handcrafted by someone in the family or a close friend; adding the child’s name on the horse with hand engraved right into the wood and it will be heirloom treasure toy to keep forever. Personalize a child’s rocking chair with the baby’s name either before or after the baby is born. The rocking chair will be a great accent piece for the nursery décor until the child is old enough to start rocking. Until that point, old enough to rock, the rocking chair ought to be shared by a buddy in the nursery who just might be a huge teddy bear or giant stuffed animal. Handcrafted items are easily found at craft shows or specialty boutiques. Other traditional heirloom gifts include the silver cup, silver baby rattle, silver piggy bank or babies comb and brush sets. Baby keepsakes are always beautifully made and treasured forever. Hand-made baby blankets and quilts have been a favorite gift for generations since you know the supplier has devoted hours and hours of their time making the gift just for your baby. Personalize and monogrammed gifts have gained popularity over the years and for good reason, they are always well-received and appreciated. Personalization makes a gift truly unique in its own right. Since many expectant moms will not have a baby name decided on nor do they wish to know the gender the personalized present can be completed at a later date which is perfect if you want to include the baby’s birth date. Before you start shopping gather information about the mother-to-be, check the registry and research online. The internet offers a wealth of information, articles and shops that cater to special occasions and baby gifts. Say goodbye to toy clutter. It is easier said they done. Now that you have a lot of kids playthings around the home, organization is key to eliminating the toy clutter. How do you organize and rotate so children do not get bored with there beloved toys? The answer is organization which has different meaning to each of us, especially from a child’s view point. Plastic storage boxes, plastic tubes or toy boxes work great. The key is try to organize by category, for example, boys love trains so you might take the train tracks, trains, plus the accessories and store in a plastic container with a lid. This is one ideal solution and easy way to keep it all together, as compact as possible. This helps to eliminate the frustration of looking for the playthings all over the house when they want to be played with. For girls who love dolls, this works equally as well, especially because of all the little parts associated with doll play like, combs, brushes, doll clothes, doll shoes, and a large array of other accessories. When it’s time for creative play involving paint, paper, scissors or crayons there are lots of ways to keep these tools organized. One of the best solutions on the market are activity storage carts that organize with built in features like storage compartment, shelves and drawers. By organizing toys by category you can easily rotate play things by theme. Children tend to get bored with there possessions so a monthly rotation can bring new play life to an object. Especially if the child forgot they even had even owned the item. Children are intrigued as they rediscover old toys. They might even be surprised that they forgot how much they really enjoyed playing with it. You will be delighted seeing your child having fun as you watch them play as though they were seeing it for the first time. Having a toy box is great and they look wonderful in a play room or bedroom plus they help eliminate the clutter by teaching children to put there toys away when play time has ended. Sometimes, when a child opens the lid and finds all different types of toys in the box they can become overwhelmed and do not know what to play with first, that’s why organizing by theme works wonderful.